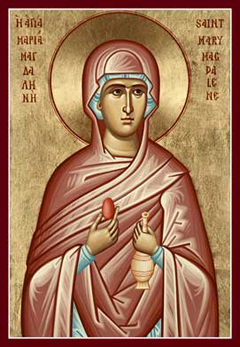 Mary Magdalene was one of the myrrh-bearing women and "equal to the apostles." She was born in the town of Magdala along the shore of Lake Gennesaret and was from the tribe of Issachar. She was tormented by seven evil spirits from which the Lord Jesus freed her and made her whole. She was a faithful follower and servant of the Lord during His earthly life. Mary Magdalene stood beneath the Cross on Golgotha and grieved bitterly and mourned with the All-Holy Birth-giver of God. After the death of the Lord she visited His sepulchre three times. When the Lord resurrected she saw Him on two occasions: once alone and the other time with the other myrrh-bearing women. She traveled to Rome and appeared before Tiberias Caesar and presenting him with a red colored egg, greeted him with the words: "Christ is Risen!" At the same time, she accused Pilate before Caesar for his unjust condemnation of the Lord Jesus. Caesar accepted her accusation and transferred Pilate from Jerusalem to Gaul where, this unjust judge, in disfavor with the emperor, died of a dread disease. After that, Mary Magdalene returned from Rome to Ephesus to St. John the Theologian whom she assisted in the work of preaching the Gospel. With great love toward the resurrected Lord, and with great zeal, she proclaimed the Holy Gospel to the world as a true apostle of Christ. She died peacefully in Ephesus and, according to tradition, was buried in the same cave in which seven youths were miraculously put to sleep for hundreds of years and, after that, were brought to life and then died (August 4). The relics of St. Mary Magdalene were later transferred to Constantinople. There is a Russian Orthodox convent dedicated to St. Mary Magdalene near the Garden of Gethsemane. We receive forgiveness of sins by your prayers! The most glorious Mary Magdalene offered praise with tears. She cried out: What is this strange wonder? Glory, O Lord to Your power!